Cambridge House is in the blue box on the map below. The area in yellow contains listed Rushgrove House, which will see a conversion into residential as well as a small number of additional houses built beside. 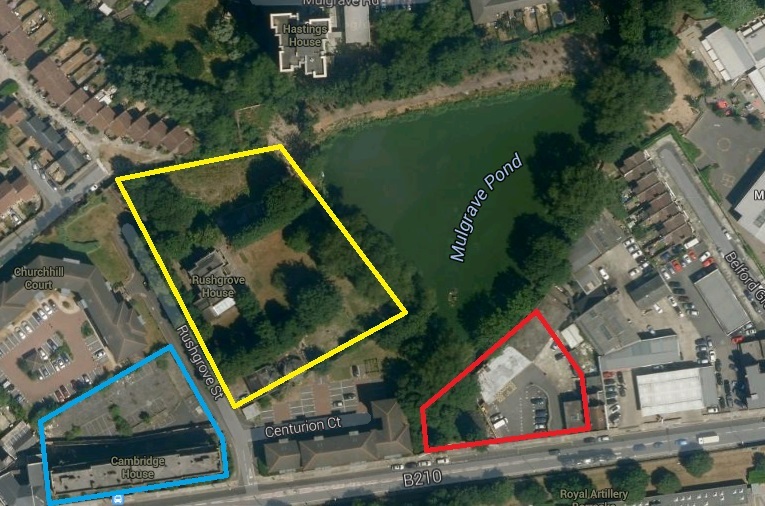 The red area currently contains a car showroom, and plans are in for 52 homes here. The area in red is 38 Artillery Place. 52 homes are planned here. 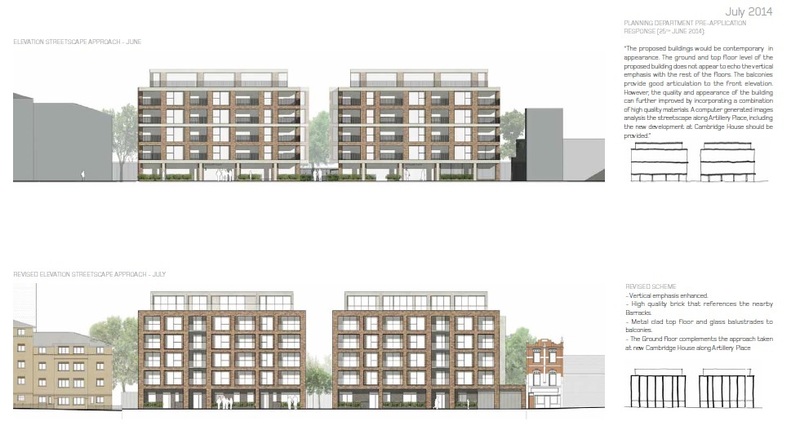 The render on top is the initial plans, with the final design below. A definite improvement, with a stronger, more defined frame and connection between street level and those above. The listed building at Rushgrove House sees conversion and subdivision into a number of flats, with a small row of houses. The site is to the top of the pond below. The car showroom site is to the bottom left. Just along the road is another decent building, which I’m guessing dates from around the 1930s. 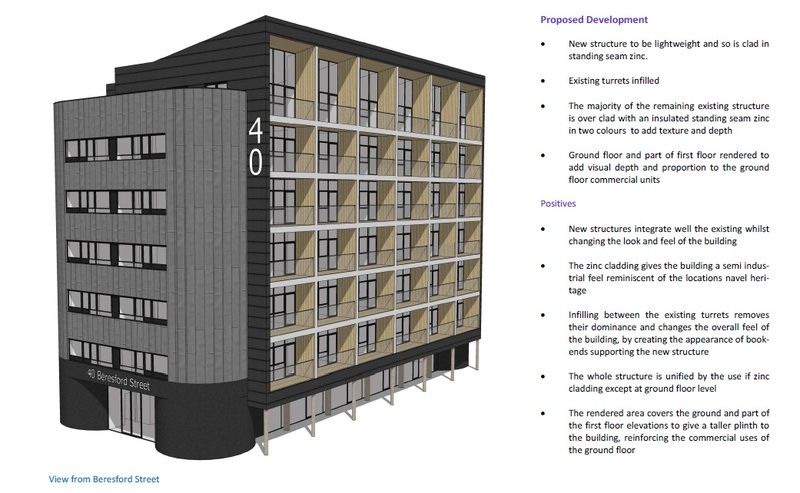 It has recently been boarded up, and is next to yet more car parking, a petrol station and car showroom, so it would be no surprise to see housing plans pop up for it. This site stretches a fair way back too behind the building. Elsewhere in Woolwich planning is in to convert an office building next to Lidl, opposite the stalled, half-finished, Arsenal hotel. Unlike Lewisham citibank’s conversion, this is a more substantial job. Much of the exterior is re-clad in a variety of grey with additional storeys added. This could end up looking pretty drab. Hopefully the use of timbre within each balcony will relieve the grey. Retail is planned at street level. With a hotel opposite (it’ll get there eventually) and high density housing, the commercial units will hopefully not be vacant for long. 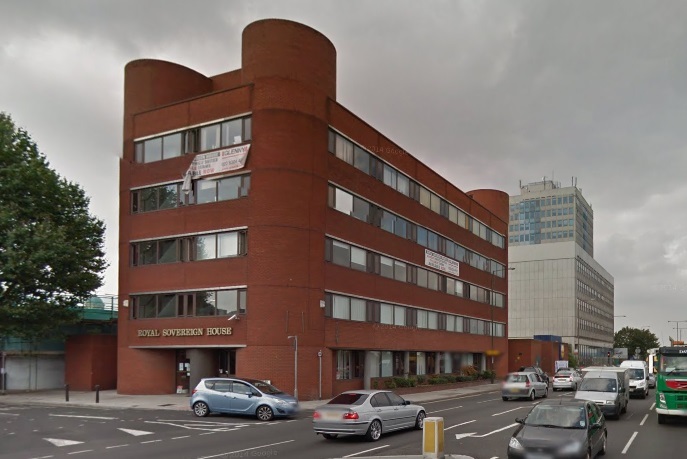 Does anyone know the fate of the former council offices at Riverside House? This looks like another prime conversion to residential candidate. The road around here has recently been altered and thankfully many of the grim guardrails have gone. Much more of that please Greenwich council. But they’ve retained a wide central reservation. 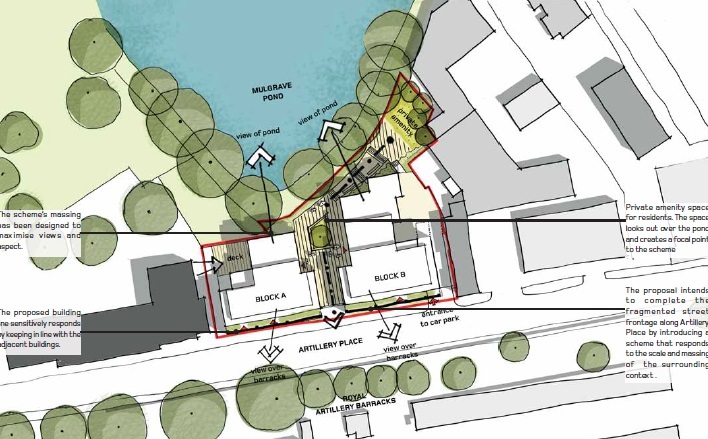 It seems a waste of land – have a narrow reserve instead and you can have wider pavements alongside the road including a segregated cycle lane for a good stretch of road in the reclaimed space made from narrowing the central reservation. If you want to cycle along here you’re dicing with buses stopping, pulling in and out, and so many just wont do it. It’s far too dangerous. There’s no right turn section here for a fair distance so the reservation could have been narrowed. One more question, the fine old Victorian school to the left of the above image was torn down a few years back. Why? There were plans for residential conversion, as seen in many similar old school buildings. This didn’t happen. I’ve never seen any plans for the site since. 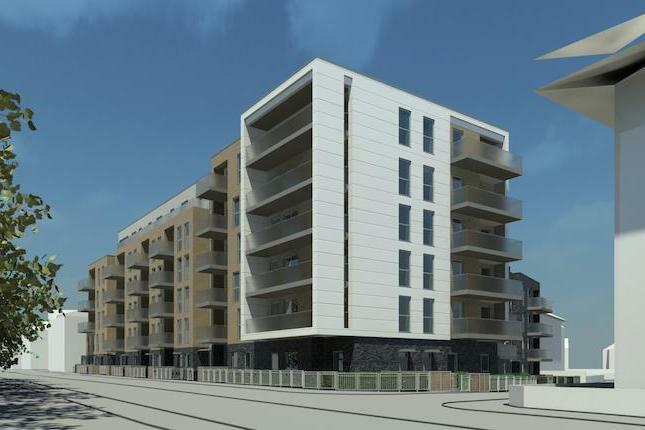 Finally, planning is in for 13 new homes at 39 Samuel Street in Woolwich, close to Woolwich Dockyard station. Not much to report here as early days, but it replaces a disused garage site. A good infill scheme of underused land providing much needed housing. I heard a few weeks ago the owners of riverside house were meeting to discuss potentially turning it into residential. I’m sure that’s what they’ll end up doing given its location. The tearing down of the old school and that beautiful Art Deco block for Cambridge house is an absolute travesty. 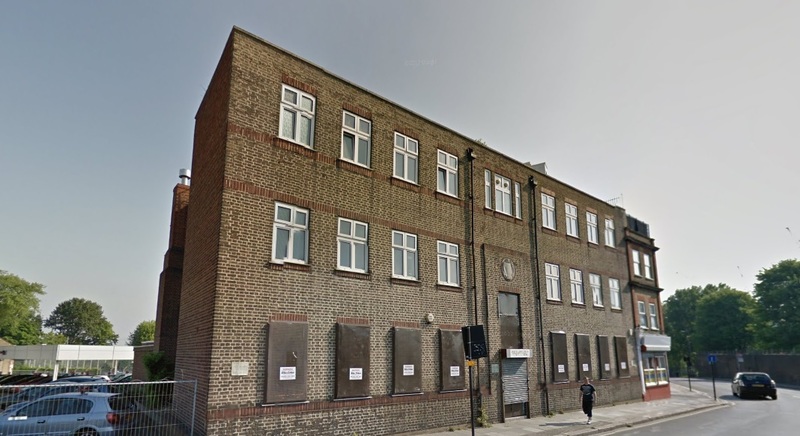 So little of Woolwich’s heritage remains – the planners really ought to be protecting the little that is left. 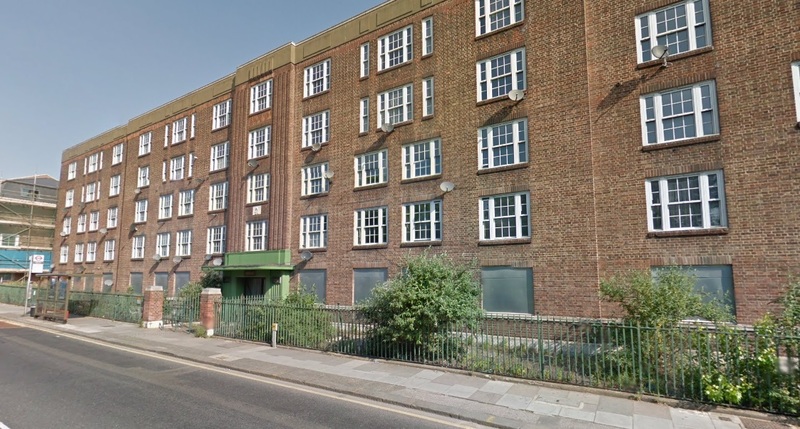 I’m all for building more houses / flats and happy to see towers go up on vacant riverside land but why destroy the few bits of character that managed to survive the Luftwaffe and post-war planners? The developers would never have got away with this in wealthier parts of the borough. Thanks for publicising this. I actually went to school in that “fine old Victorian school”. Having spent two years on my life inside that building I remember the internal stairwells were very uneven and twisted and of the three entrances I remember, I think two were accessible only by steps. I strongly suspect fixing the building to meet modern standards wouldn’t have been economic. I suspect it’s always cheaper to knock down Victorian buildings and smack up something new in their place, particularly when they’ve been neglected for awhile. The problem is that the character of the entire town suffers when these things are lost. Woolwich has plenty of cheap, bland, run-down post-war buildings which do nothing positive for the place’s character. The rare historic bits ought to be preserved if the town is to retain any soul. London needs more homes and they need to be built quickly but the little bits of heritage this end of the borough has need to be protected. They did manage to convert the Victorian school on Sandy Hill Road to flats.